A CONSTITUTIONAL stoush has been sparked by a Family Court ruling that it can compel state welfare agencies to take a role in the parenting of at-risk children. Judge Robert Benjamin ruled that he had the power to impose a parental responsibility order on a state agency when there were “no other alternatives” for at-risk children. The Tasmanian government has appealed against the judgment, which legal sources say could end up in the High Court, with the commonwealth backing the ruling and other states taking a keen interest. Tasmanian Solicitor-General Leigh Sealy SC told a full bench of the Family Court yesterday that Justice Benjamin’s ruling was “as startling as it is erroneous” and tantamount to “civil conscription”. 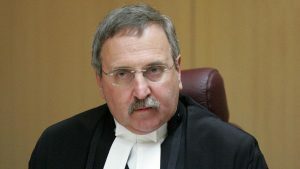 Justice Benjamin’s landmark ruling came in a case involving two children — aged 15 and nine — whom he was concerned, after hearing evidence, were at risk of “emotional, physical and sexual abuse”. The judge concluded that “it is possible, if not likely, that either one or both of the children . . . will be left in a position where none of the parties to the proceedings or available family members are suitable to have parental responsibility”. He directed that a copy of a court order related to the case be forwarded to the secretary of the Tasmanian Department of Health and Human Services, David Roberts. However, counsel for Mr Roberts told the court he was unwilling to intervene or accept any parental responsibility order. Further, the state said it believed any such order without consent would be outside the court’s powers. On March 31 last year, Justice Benjamin ruled otherwise. He noted that: “If the secretary (Mr Roberts) was not a party to these proceedings the children or child would be left in impossible situations. “This court has . . . a duty to protect children from physical and/or psychological harm and from being subjected to or exposed to abuse, neglect or family violence. Justice Benjamin said such a situation “cannot be the law in Australia in the 21st century”. “If the state chooses not to become involved in the responsibility for a child when there are no other options, then it would beggar belief that a court does not have power to impose that obligation upon the state,” he ruled. Mr Sealy told the court yesterday that Justice Benjamin’s comments may be “laudable” but his ruling was inconsistent with the law and “overreached” his jurisdiction. The court reserved its decision. It is understood the two children involved in the case have been taken into state care since Justice Benjamin’s judgment.